The duo of Andrew Marlin and Emily Frantz enlist the help of a quartet of instrumentalists to help flesh out their acoustic-based bluegrass/folk on their lovely fifth album. 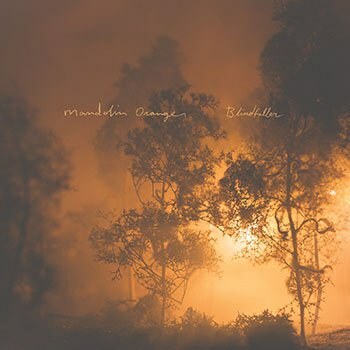 For their fifth album, Blindfaller, North Carolina duo Mandolin Orange expand their ranks to include four additional members on keyboards/guitars, pedal steel, bass, and drums. Augmenting their original mandolin and fiddle configuration, Andrew Marlin and Emily Frantz manage a fuller sound without relying on the volume that additional musicians could have afforded the group. Instead, they utilize the talents of Josh Oliver, Allyn Love, Clint Mullican, and Kyle Keegan in a manner more suited to subtle shadings and nuance, fleshing out the duo’s spare acoustic arrangements and providing a warm undercurrent for their Appalachian harmonies. And what gorgeously laidback harmonies they are. Together, Marlin and Frantz manage an effortlessly unaffected vocal merging that lies rooted in their bluegrass roots, yet carries traces of both country and contemporary folk. The enlargement of the studio group helps further emphasize these subtle stylistic differences. With its driving backbeat shuffle and chicken-pickin’ guitar work, “Hard Travelin’” may well be one of the most straight-ahead country tracks the group has yet released. It’s one of the few moments on Blindfaller that manages to rise much above the standard low-key balladry that makes up the bulk of the album. Because of this, it serves as a thrilling highlight not only on the album but for the newly-expanded group as well. One hopes they choose to further explore this particular path on future releases. The remainder of the album is largely an expansion of and on their established sound, a 21st century amalgamation of traditional bluegrass and contemporary folk that manages to remain more in the traditionalist vein than those more mainstream acts operating under the “folk” banner. There’s an earnestness to the duo’s delivery and approach that imbues the music with a rustic honesty and simplicity that belies the complexity of the harmonies and instrumentation. “Echo” is perhaps the best showcase here for the duo’s earthy harmonies, evoking a certain sadness redolent of bleak winter mornings spent cold and alone in an empty house. Similarly, “Take This Heart of Gold", a stark, guitar and vocal ballad, allows Marlin and Frantz to showcase the seamlessness with which they are able to intertwine their vocals. Retaining a primarily acoustic sound, Mandolin Orange serves as much as a showcase for the duo’s vocal talents as fine instrumental interplay. Opening track “Hey Stranger” allows Frantz’s crystalline vocals to come through with the same heartbreaking clarity and prominence found on early Alison Krauss and Union Station albums. Yet there’s nothing slick about the production here. Rather much of Blindfaller is so well recorded it sounds more like a live performance transpiring before the listener in real time than that of a studio recording. There is a warmth and resonance to Jerry Brown’s production that perfectly suits the duo’s throwback aesthetic. Marlin’s mandolin on “Hey Stranger” in particular sounds as though it were being played mere inches away from the ear of the listener. So clear is its presence and articulation that it, coupled with Oliver’s banjo in the right channel, provides the listen with a warm, acoustic embrace that can easily be lost with these strident instruments. Both “Cold Lover’s Waltz” and “Picking Up Pieces” benefit from Keegan’s shuffling snare, allowing both Marlin and Frantz to color in the phrases rather than carry the rhythm in each. This more impressionistic approach not only affords the track greater space but helps enliven the phrases of each instrumentalist as they come to the fore. Coupled with Love’s haunting pedal steel, the group’s sound begins moving in new and different directions both in keeping with their traditionalist bent and looking to explore a more varied sonic palette. Blindfaller offers little in the way of revelatory performances or musicality and that seems to be exactly the point. In a genre in which instrumental virtuosity is often overly praised, the members of Mandolin Orange manage to keep the focus on the strength of the material, not those behind the wheel. Taking this approach, each song manages to largely stand on its own both lyrically and melodically rather than hinging on a solo or instrumental break. In this, Blindfaller proves to be yet another fine, workmanlike effort from this wonderfully consistent pair of gifted songwriters and Americana preservationists.